An ambitious project (and a Whitney Award finalist), Belonging to Heaven covers a span of 36 years from 1843 to 1879 and the setting ranges from California to the Sandwich Islands (now known as Hawaii) to Salt Lake City, Utah. This touching story is told in three sections titled aptly: Faith, Hope, and Charity. Over the course of the book, the main focus shifts from the earliest missionaries that were called to Hawaii - primarily George Q. Cannon - to one of the earliest Hawaiian converts - Jonathan Napela - and finally to the leper colony on a remote corner of Molokai. This shift allows the author to tell more of the story, but it also felt like the focus wandered a bit. I wonder if it would have been better told in two separate books, the first focused on Elder Cannon and his companions and their struggles with the difficult language and foreign culture, and the second telling Jonathan Napela's story of conversion and faithfulness. I loved the beautiful, descriptive language throughout and the generous sprinkling of Hawaiian - I found myself sounding out the phrases and trying them repeatedly until they came off my tongue easily. And respect for the Hawaiian culture, in contrast to more imperialistic, colonialist attitudes I half-expected, permeated each page. Speaking to President Brigham Young, Elder Cannon reports "the missionaries who were most successful with the Hawaiian people were those who respected their goodness and culture, the ones who acknowledged their simple faith and openness." Many good and uplifting Hawaiian traditions are continued and embraced by the American missionaries. And the final section is a moving story of interfaith work, service, and love. 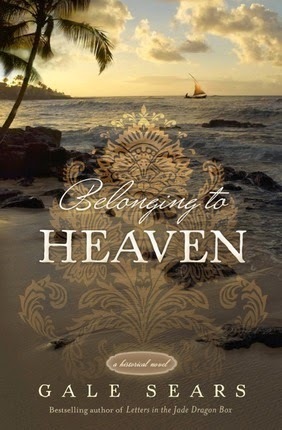 Belonging to Heaven is obviously thoroughly- and well-researched, and I appreciated the attention to detail both regarding the early Church and native Hawaiian culture and history. I liked that each chapter ended with a handful of bullet points further illuminating some event or action from the chapter; this seems a better idea than constant footnotes that pull the reader out of the flow of the story or throwing all of the information in an appendix that is less likely to be read. However, some of the chapter-ending footnotes referenced events several decades later than the story, some repeated information from the chapter or from earlier chapter-ending footnotes, and some simply seemed odd, trivial, or out of place. They also seemed understandably biased toward LDS history, and I would have liked a bit more Hawaiian history as well. The book presents an open and loving interpretation of the gospel. While Jonathan joins the church, his wife and children do not, and not a single negative word is spoken about this mixed-faith marriage. Again and again, characters are encouraged to "receive your own revelation", reminded that "the Lord loves all his children", and told that "each person must follow their own path." Jonathan himself is a shining example in his actions and repeated assertions that "I am not afraid of change" in the midst of a time of enormous upheaval in his family and culture, though he recognizes that "one must treat change with careful respect, for it can bring destruction or improvement." Sears is also honest and forthcoming about mis-steps by Church leadership in the Hawaiian Islands. For example, when leaders proclaimed that the Hawaiian Saints should all gather to the island of Lanai, it demonstrated an ignorance of "the Hawaiian people's attachment to the land...[and] the places of their birth" and when life on Lanai proved difficult, many simply returned to their homes. Calling the American missionaries home in 1857 left the recent Hawaiian converts "like sheep without shepherds." And then one opportunistic member of the Church, a Mr. Gibson, took advantage of the situation. "Mr. Gibson had taught them false doctrine, sold priesthood offices, and put land titles under his name-bilking the Saints out of property to which they'd contributed." While he was excommunicated as soon as his nefarious deeds came to the attention of Church leadership, great damage had been done. Between all these misfortunes, membership in the Church declined from 4000 in 1857 to only 300 in 1865. But Sears also shows a sympathetic side of Brigham Young, the president of the church at the time. He calls on those with experience in the Islands - including George Q. Cannon and the future president of the Church, Joseph F. Smith - before making his decisions regarding the Saints there, so "we won't make the same mistakes." And he focuses on "practical salvation" and "partial gathering" - a very pragmatic approach.